Ask young people about the Constitution. They will probably parrot that it is a “living document” – that is, it has no fixed meaning, but means whatever judges say it means. Next week it may mean something else. But what assurance is there when officials swear to uphold something with no fixed meaning? Nor do they know what rights are enumerated in the First Amendment. Nor have they ever heard that our rights come from God, and that the Constitution merely guarantees what we already have. Or ask young people about George Washington. They may know something about the Revolution and the founding of our nation, but they are almost sure to say, “Washington owned slaves.” They are unlikely to add that he freed them at his death. The negative aspects of the man obscure the positive aspects − that’s what young people have been taught. Ask about Abraham Lincoln. A young person is likely to say he was a racist. Yes, Lincoln did express what would be considered racist views by today’s standards. But he held the Union together in a Civil War that was fought over slavery, and as a result slavery was ended. Lincoln was shot for his efforts − doesn’t he deserve some credit? But not to our “educators,” who teach that the Civil War was “all about economics.” Do you know 360,000 people willing to die for “economics”? Do you know even one? How many European leaders were named Abraham? And how many European nations have towns named Bethlehem, Nazareth, or Bethesda, or parks named Zion? I can’t think of one. Unlike other nations, America is based on Judeo-Christian values. But we’re in the process of erasing them. Lincoln was not referred to as “President Lincoln,” or even as “Honest Abe.” No, he was called “Father Abraham,” a clear reference to the biblical father of the Jewish people, and the first standard-bearer of the Judeo-Christian tradition. But do high-school or university seniors know who Abraham was? Ask a young person about Grant. If you are lucky, he will say that Grant is the man on the fifty-dollar bill. But the general who led the Union to victory and thereby ended slavery? Are you serious? Or ask about Jefferson. 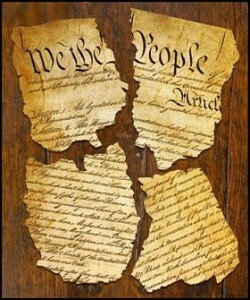 If you are lucky, the young person will mumble something about “the wall of separation between church and state.” But the author of the Declaration of Independence, our founding document, which declares that our rights come from God, not from the government? Are you joking? If I forgot my wedding anniversary, my wife would remind me − and in a not very pleasant manner. But what if she forgot as well? Superficially, there would be no problem. We would spend a day like any other. But on a deeper level, there would be a serious problem. The fact that we both forgot our anniversary would indicate that our relationship had already suffered serious deterioration. Our amnesia would be symptomatic of a more basic problem. What is true in personal life is also true in national life. Our national amnesia is related to deterioration of our society. This amnesia is induced by our educational system. From primary school to middle school to high school to university to graduate school, students are subjected to a curriculum filled with socialism and pacifism, but bereft of anything remotely resembling Americanism. Ask anyone under the age of 40 when is Washington’s or Lincoln’s Birthday. They will be unable to tell you, or even to guess why you asked. If I develop amnesia, other people may be able to remind me of what I have forgotten. But what if everyone around me also has amnesia? Not only will they be unable to remind me of what I forgot, but they will not be aware I have forgotten anything. Mass amnesia is serious precisely because it is unrecognized, and an unrecognized condition is never remedied. No one knows there is anything to remedy. When Michelle Obama said that when Barack was nominated, it was the first time in her adult life she was really proud of her country, she did not misspeak. She revealed how she, and many people like her, really feel. Elections every four years, with peaceful change of administrations? People of all ethnic, racial, and religious groups serving in our armed forces and risking their lives for their country? The firefighters and police on 9/11? The passengers on United Flight 93? The 19 Medals of Honor awarded for service in Iraq and Afghanistan? Over 60% of the recent Nobel Prizes in Medicine, when we represent only 4% of the world’s population? The soil of Europe and Asia soaked with the blood of hundreds of thousands of American troops who died to remove the shackles of tyranny from other nations? All that is nothing to be proud of? The author of one of the most widely used textbooks of American history, the late Howard Zinn, claimed that America has done more bad than good in the world. I heard him say it. Europe under the Nazis? Asia under the Japanese fascists? To him, that would be preferable to a strong America. Just as I would have been damaged if I were taught that my father was a good-for-nothing or a criminal, so our young people have been damaged by teaching them that their founding fathers were worthless at best, and actually destructive at worst. But the damage is not irreparable. Our curricula must be freed from anti-American bias. We do not want chauvinism, but to avoid it we need not teach anti-Americanism. We do not want super-patriots, but we need not try to produce no patriots at all. Our enemies have fanatical beliefs, but to avoid fanaticism we need not try to destroy our own beliefs. We are engaged in a culture war with extremist Islam. Leftists assume that if they dismantle American culture, and Western culture in general, the vacuum will be filled by a beautiful, nebulous, homogenized mixture of all the cultures of the world. But this mixture does not exist. What will fill the cultural vacuum is the primitive, seventh-century culture of extremist Islam. This is already happening in Europe, where polygamy is now accepted. What’s next? Kicking blind people with guide dogs out of taxis and shops? Wife beating? “Honor” killing of daughters and sisters? Genital mutilation of girls? Will that be multicultural enough for you? Oh wait, it’s already happening. In addition, we need to restore biblical literacy for young people. The vitriolic criticism President Trump evoked by making this suggestion only underscores its importance. A generation that doesn’t know what happened between Cain and Abel, or who Abraham was, has been robbed of its inheritance. If I steal young people’s financial inheritance, I am branded a despicable thief and sent to prison. But if I steal their spiritual and cultural inheritance, I am praised as “progressive.” But I am an even worse thief. The first rule of gun fights is bring a gun. 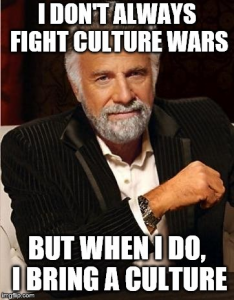 The first rule of culture wars is bring a culture. Those who are tearing down our culture are, in fact, disarming us. If they are lucky, people who are disarmed physically may regain their right to possess weapons. But people who are disarmed culturally and spiritually? What about them? Can they regain their rich inheritance once it has been lost? Do they even recognize that they have lost anything?